From the publisher: Normally, the arrival of an art exhibition at the Mayville Heights library would be cause for celebration. But thanks to the overbearing curator and high-tech security system that comes with it, Kathleen’s life has been completely disrupted. Even Owen and Hercules have been affected, since their favorite human doesn’t seem to have a spare moment to make their favorite fish crackers or listen to Barry Manilow. 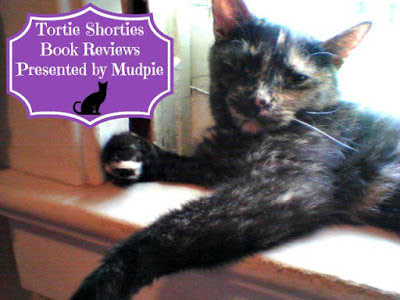 The Magical Cats Mystery series is quite simply, pure magic. Owen and Hercules are back for their 5th adventure in Faux Paw and more adorable and clever than ever. An art exhibit has set up shop at the library and Kathleen has been forced to deal with it's very difficult curator, Margo Walsh, and all of the added security that comes with it. The exhibit's focal point is a detailed drawing of a Dakota encampment by military artist Sam Weston, and is worth a small fortune due to the mystery surrounding it. Late one night Kathleen stops at the library to find Margo dead - hit over the dead by a brass cat statue on Kathleen's desk, and the Weston drawing is missing. In addition to a killer on the loose, the exhibit tour is cancelled because the museum is came from is undergoing renovations, so the library is forced to stay closed until it can be moved out. Our protagonist Kathleen is a lady that I can easily see myself being friends with, and her favorite snack of hot chocolate and peanut butter toast has my mouth watering each time she shares it with her beloved feline friends! Speaking of which, Owen and Hercules seem to be quarreling yet they still manage to lead Kathleen towards important clues. And Kathleen's good friend and veterinarian Roma is facing a huge dilemma in her relationship with hockey player Eddie. The ongoing story lines among the characters make each new book like a reunion with old friends. Faux Paw sounds delightful, and I adore the cover art. Thank you for the chance to win. 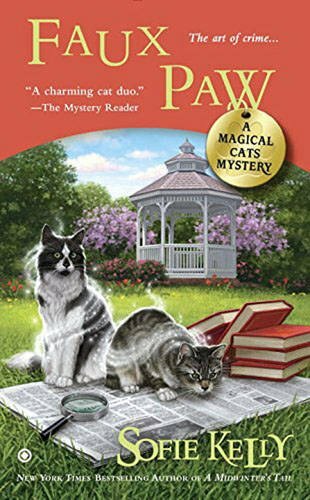 I love cozy mysteries in which cats play a significant role—thanks for the chance to win a copy of this book! Owen and Hercules seem to be just perfect cats for a cozy mystery. I'd love to read this one. Thanks for the giveaway. I do like this series. I'd love to have the cats visit. Sounds like a nice series. I have some catching up to do now that there are 5. I love this series. Happy to see a new one. Thanks for the review. Another new author for me ... thanks for the introduction. Sounds like a fun read! I adore this series and wish I could meet Owen and Hercules-they are magic! cozyupwithkathy @ gmail dot com. Thank you! I love kitty cozies!! Love - love - love this series! It's a chilly fall day here, so curling up with cozy kitty mystery sounds great! I love cat-themed cozy mysteries. Thanks for the chance to win this book. I'll be reading it for sure! Entering to add to my wife's collection. With winter coming, she likes to curl up with a good book by the fire on her days off. I love The Second Chance Cat series & I've been wanting to try this one. It sounds great too. I know it's too late to win, but I love this series.